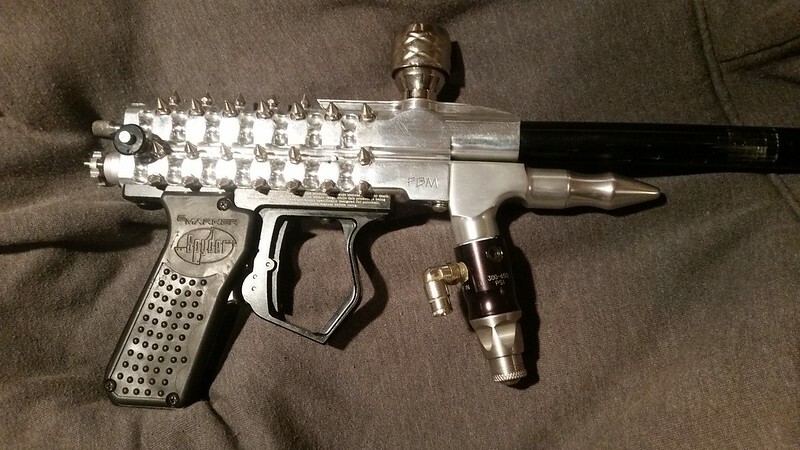 Would love to see a few pictures...I'm also curious about the spikes. What did you use? How did you mount them? And where did you get them? Hmm. i got the spikes (simple 4-40 thread hex spikes) at studs & spikes .com, they run about $13per hundred, only place i found online with 4-40 threaded spikes. i ended up locktiting the screw partially threaded in, then cutting the heads off (same thing i did for my gothic cocker). i also threaded the back of an acs bolt for 10-32, added a short rod, capping it with another spike (again, same as my cocker). 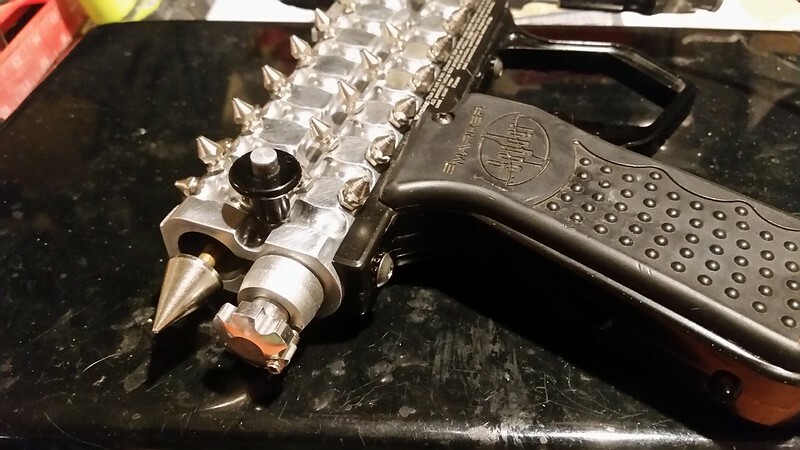 Im wondering if I own your old Gothic Cocker because it has spikes that look like that, whereas my Impulse had no base to the spike, but rather just a spike with a threaded end. And I really like that 32* expansion chamber. What I'm wondering is if Im running n2, do I have to run a regulator instead? I don't really have two tanks setup for different pressures. It's just setup for whatever my impulses/angel needs! If you have a standard output HPA tank (~800/850psi) you will be fine. Heck, even a super high output tank should work ok, but springing would need to be tuned. an LP tank would require the Spyder to be tuned for LP (internals wise). The Ex chamber should not really matter much or affect anything with HPA. But also, I sort of want to piece something together and make it awesome. I know your pain, lol. If I had the body, I would go balls to the wall sweet. I think rare bodies should get special treatment. It would look great in a red/black acid wash. I think what I need to do first is compile a parts list of what I am actually going to do. I have a list above someone compiled for me.. I don't want it to be low pressure or anything fancy like that. I guess I just need to know best stuff out of that list that will work together. I’ve got quite a few parts on that list too! I even have an Alamo City Delrin striker and bolt set! I’m still trying to figure out how far to take my original spyder imagine. I’ve never been one for the fancy/rare bodies except for maybe a Black Widow spyder, but I don’t foresee that ever happening.